I was a Corner Marshall at MotoGP! 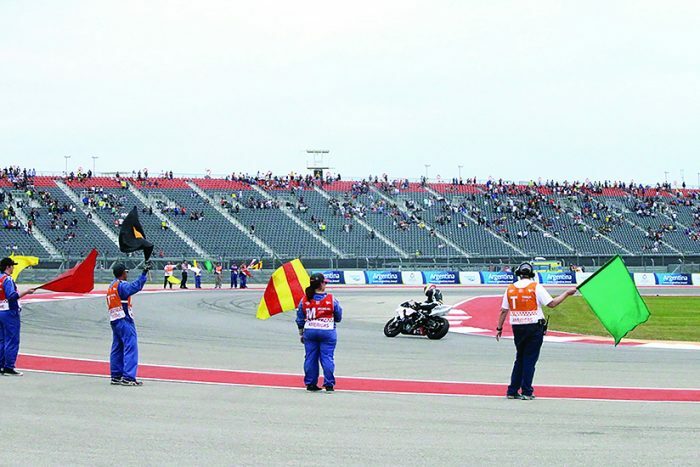 When MotoGP returned to the Circuit of the Americas, in Austin, for its third straight year I had the best seat in the house: this year I was a corner marshal—and the experience was better than I could have hoped for. 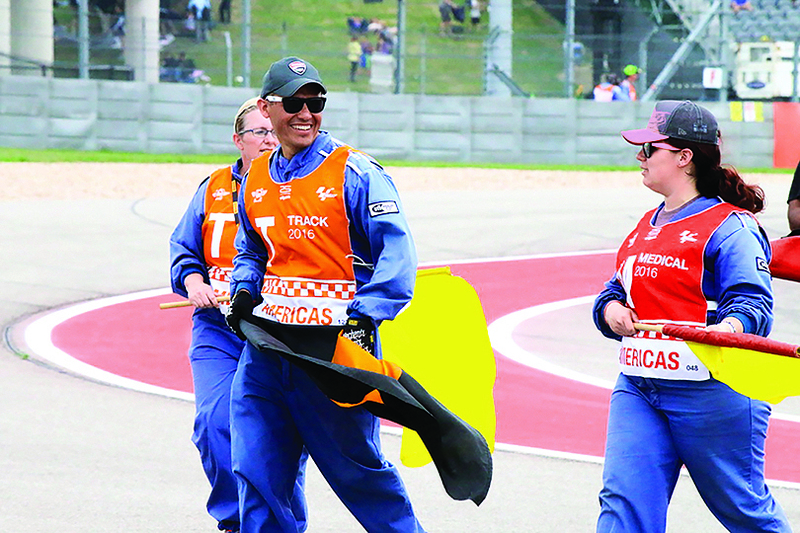 A corner marshal is a track worker who keeps the racing safe by maintaining the racetrack. The race weekend ran Friday through Sunday, and I reported for mandatory training on Thursday. Organizers assigned me to Turn 13 and handed me a fire-retardant jumpsuit. I brought my own work gloves and earplugs. As I waited for the training to begin, I looked around at the others sitting next to me: men and women, young and old, from all walks of life had shown up. A few said they “corner-worked” as often as they could. But most were first-timers like me. Some signed up to work as medical marshals to assist racers after a crash. Others chose to serve as flag marshals, who relay track conditions to racers with different colored flags. Green means go; red means the race has been stopped; yellow and red-stripes means there might be oil on the track. Each day, we reported for duty at 5:30 a.m., folding chairs in hand, costumed in our saggy, blue jumpsuits. On Friday, it drizzled off and on. Our crew saw half a dozen riders fall and slide unharmed across the tarmac. Whenever someone crashed, we would help the rider rejoin the race or, if necessary, remove the disabled bike from the track. In between races, we cleared the track of debris such as helmet visor tear-offs and chunks of rubber and gravel. After each race, we walked to the edge of the track, waved flags, and cheered the racers during their cool-down lap. On Saturday, defending MotoAmerica Superbike Champion Cameron Beaubier crashed while leading in the first race. Coming into Turn 13, he tucked the front while braking hard for the double apex right-hander. He slid straight through the gravel trap, his bike stopping just short of hitting the hard barriers. Our team quickly rushed to his aid. I slid my hands under the tank of Beaubier’s dust-covered Yamaha and pulled it upright. 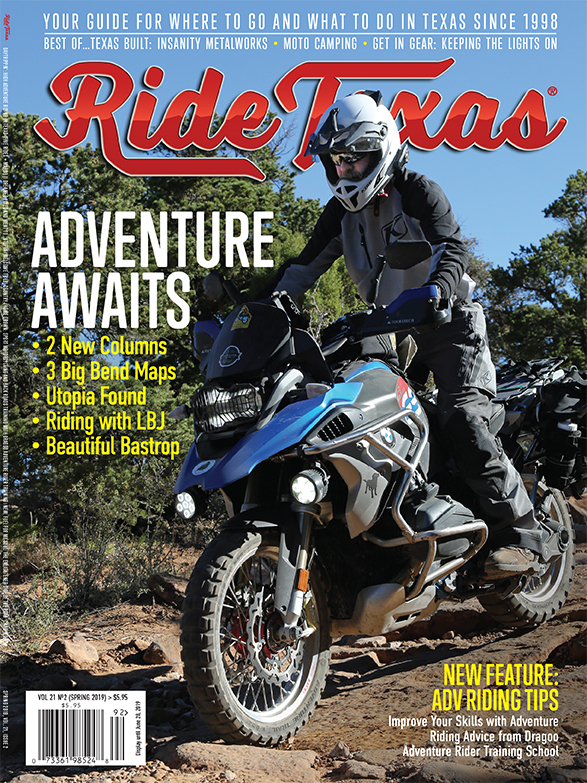 Though his windshield was busted and his clutch lever was broken, Beaubier hurriedly remounted his machine. He thumbed the starter and wrung the throttle hard in frustration. The exhaust roared so loud it left my ears ringing. In a moment he was gone, headed back to the pit. On Sunday, rider Marc Marquez again decimated the competition and cruised to a convincing victory in the premier MotoGP 2016 race. As the racers took their cool-down laps, all the corner marshals waved flags and hollered in appreciation of a great race. Some riders waved or gave us high-fives; others pulled stand-up wheelies or flashed a thumbs-up. Then it was time to pack up. As a track worker I had access to the behind-the-scenes flurry that television doesn’t bother to show us. Team members hurriedly packed toolboxes and crated up the racebikes. Others hung out and chatted with friends and members of rival teams. Soon they would all be gone, headed across the Atlantic to the next race in Spain. I said hi to racing legends Randy Mamola and Kevin Schwantz, but I just missed out on getting autographs from star riders Valentino Rossi and Jorge Lorenzo. This was not the first time I’d been to a MotoGP race, but as I stood there in the pits posing for a picture with race winner Marc Marquez, I realized how different this year had been. And a heartfelt grin spread across my face.